Anglian Home Improvements strives to ensure your products are fitted to the highest of standards. Our installers come from a variety of different backgrounds, and with that they bring an array of experience, followed up with expert training to give you a stress free installation. Anglian installation teams are fully engaged by the company, including one couple who decided they would work together installing Anglian products. Daniel and Deborah Sutherland decided to become a dynamic duo when Deborah became disillusioned with life, earning less money for longer hours. Now, after 14 years of working for Anglian, Daniel has found the perfect work partner. They complement each other well and since they had been renovating their own home, Deborah had picked up a passion for building. They both had a wealth of knowledge gathered from their diverse work experience. Both had worked abroad, with Deborah being contracted with the Royal Hong Kong Police and later with the Metropolitan Police Special Branch in the UK. Daniel has worked in Qatar and Abu Dhabi. This type of experience is very impressive and although not all of our installers have worked for the police in foreign countries, they still bring with them a wealth of experience from previous building jobs. Some may have been brick layers, some plasterers, maybe even electricians; either way they not only bring their previous talents to the job with Anglian, but they are then trained in specific areas to boost their knowledge further in the building trade, and hone in on some difficult skills, ensuring your installation not only looks amazing, but is built to perfection within your home. Despite the physical challenges that Deborah has tackled, she has always come out on top, becoming stronger and learning quickly from Daniel. Deborah thinks having a woman’s touch has helped ease customers, especially women, throughout the installation process. The couple also try to explain the process from start to finish, if anything changes they tell the customer, believing that keeping the client informed will give them peace of mind the job is going well. The couple have become very popular with their friendly and professional approach, enjoying every minute of the job especially meeting new people from all walks of life and learning something new every day. The constantly changing location and customer helps keep the couple on their toes. However, it is not just Daniel and Deborah who are top installers. Other installers proved they are quick and efficient when they helped build the Green, Black and White garden at Hampton Court 2008. This award winning garden demonstrated great workmanship and clever planning from Krista Grindley, a garden landscaper from East London. She won a competition to design the Anglian show garden at Hampton Court and designed this beautiful garden, surrounding a stunning Victorian conservatory. This RHS silver gilt garden took 21 days to get to the final product, but the conservatory only took 7 days, despite it being a tricky build with foundations and a back wall having to be built. 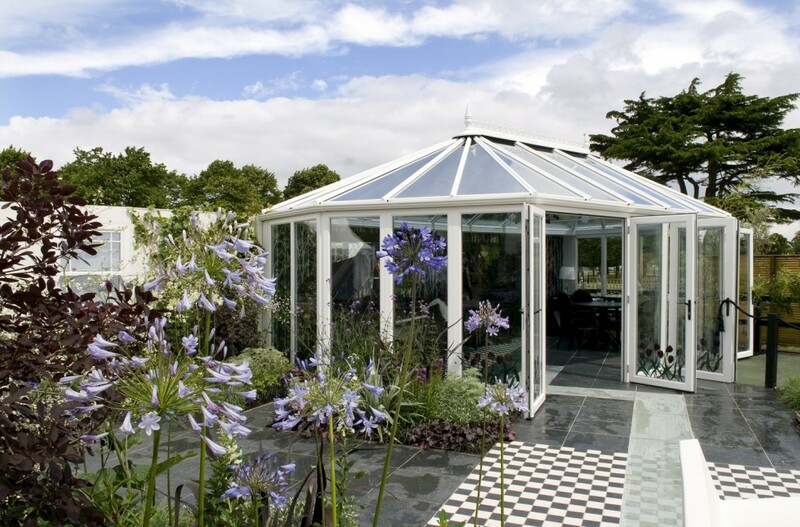 The beautifully designed garden showed how a conservatory makes an excellent focal point for a garden, providing a light airy room from which to admire the garden all year round. The planning was meticulous, but required a skill set not normally required in our normal day to day work. Luckily, we have the pick of a vast and highly skilled workforce, with a multitude of experiences and skills. So, when that unusual request is made we know we’ve got the resources to make your dreams a reality. The whole team pulled together to transform a muddy meadow into a tranquil, inspiring outdoor and indoor space. Unfortunately, it was destined to only last 7 days, so if you did get the chance to visit this garden you can vouch for its amazing looks and quality. If you have any recollections of the garden, please send us your comments, it was before I started with Anglian so would love to know what you all thought? !